Far away in a small Himalayan kingdom, where light and color have a mystical allure and steep mountains hold thousand-year-old Buddhist monasteries, a country pursues gross national happiness, measured by the collective well-being of its people. Physically isolated from most of the world until the 1960s, Bhutan was only accessible by foot, from a northern route through the passes of Tibet, or a southern route through subtropical plains from India’s Assam and West Bengal. It is because of this challenging topography that Bhutan has retained its ancient traditions and cultural heritage. 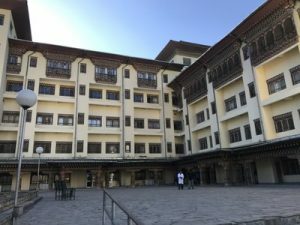 For UNC Pediatric Nephrologist Dr. Dorey Glenn, it can take two to three days of travel before his plane touches down in Paro, then there’s a two-hour drive to the capital of Thimphu. 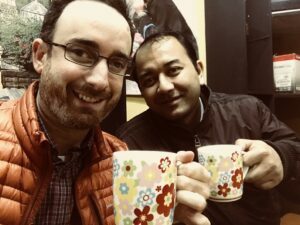 There, Glenn is working with the pediatric physicians, residents and staff at Jigme Dorji Wangchuck National Referral Hospital, named for the dynasty that replaced Buddhist rule in 1902. His relationship with the hospital and National University of Bhutan began a few years ago. Today, he’s working with the hospital’s department of pediatrics to provide nephrology training and clinical support. Jigme Dorji Wangchuck Hospital, named for the dynasty that replaced Buddhist rule in 1902. In a country that’s mountainous, that has roads, but is still developing, being able to look at epidemiology in a rural environment is not easy. But what is special about Bhutan–beyond the cultural beauty of spinning prayer wheels and colorful prayer flags, believed to generate spiritual vibrations when touched by the wind–is the country’s strong commitment to caring for its citizens, so strong that it sends patients to neighboring countries to get health services that aren’t available in Bhutan. Glenn is working with pediatric resident Dr. Dinesh Pradhan on a project to streamline management of children that present with glomerulonephritis. This includes a decision support tool that can help pediatric staff stratify patients who need more extensive work up, from those who need less. It will also facilitate more uniform care across the spectrum of patients, and at the same time help physicians become more time and cost efficient with testing, giving those patients at high risk or with atypical presentations more directed work up. Pradhan presented a poster abstract at an Asian conference in Malaysia last year. Glenn will continue this work in April, with a trip partially funded by a Global Partnership Award from UNC Global. He’ll also introduce UNC Kidney Center clinicians who have an interest in global health education, who will give teleconference lectures to the dialysis unit and house staff. Talks will include a variety of general pediatric nephrology topics, dialysis complications and quality improvement. Although difficult to reach and expensive, Glenn knew Bhutan was special, even before he traveled.